Photo of Captain Thomas Dearborn, courtesy of U.S. Navy. 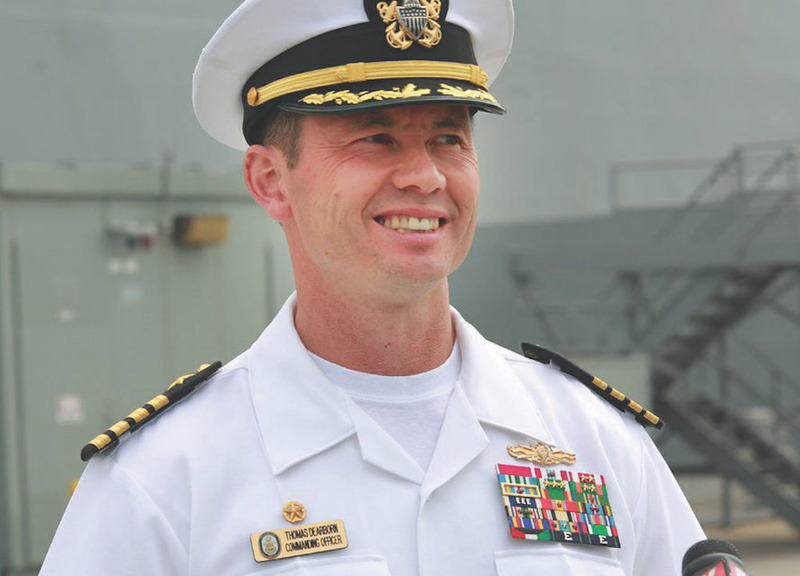 After 29 years of service to the United States, Captain Thomas Dearborn retired from the U.S. Navy on Oct. 1. This was the culmination of a long career with a nontraditional start to being an American citizen. Dearborn was born in South Korea in 1965. His mother came from a traditional Korean family, while his father was a member of the U.S. Army stationed in Korea. Because Dearborn’s father married his mother, it made Dearborn a U.S. citizen as well as a South Korean citizen. When Dearborn was young, his father left, leaving him with his mother, and they have not had contact since. When his mother became ill, she put him up for adoption in the United States, where he was adopted by the Dearborn family of Mount Vernon, Maine. “I was very blessed. Back in 1975 there probably were not any Koreans in the state of Maine. The town of Mount Vernon really welcomed me with open arms,” Dearborn said. Dearborn came to the U.S. when he was 10 years old. He was dropped into a new culture and community without any knowledge of English. “My very first day in the fifth grade, all of my classmates really welcomed me and helped me transition into their culture. I spoke no English when I arrived in this country and through the full immersion experience and the help of a lot of folks, I really picked up on the language,” Dearborn said. Similar to many Maine residents, upon graduating high school Dearborn’s adoptive parents encouraged him to go to college. The University of Maine was a logical option, and Dearborn entered the school’s college of agriculture. His third year of college, he joined the newly created Navy ROTC, which really started his career in the Navy. Having previously been involved in the Army ROTC and having a desire to serve his country, the recruiters made an efficient pitch that got Dearborn to join the Navy ROTC. Dearborn graduated from UMaine in 1988 and went to work for the Navy. In his almost 30-year career in the Navy, Dearborn was involved in many operations including Desert Storm, the Balkan Conflict, Operation Iraqi freedom in Iraq and Operation Enduring Freedom in Afghanistan. When asked which tour was his favorite, Dearborn immediately cited his first tour as a commanding officer which took place on the USS Tempest working with the U.S. Special Forces Command. Their purpose was to operate with and carry the Navy Seals all over the globe. During their tour, Dearborn brought the ship to the Southern Command Area (South and Central America) as well as crossed the Atlantic in the Central Command Area in the Persian Gulf. 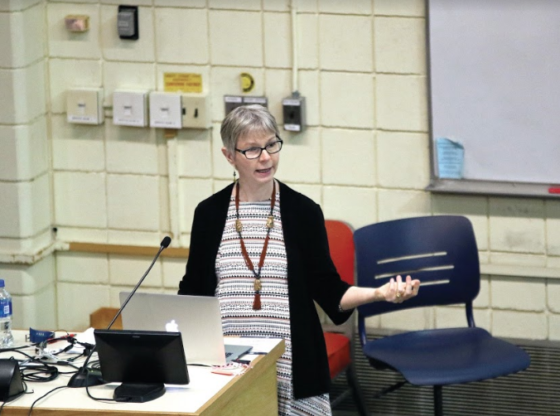 “It was a tremendous learning and maturing experience for me as a person and as a naval officer and it really prepared me for all my subsequent tours,” Dearborn said of this tour. This was Dearborn’s first position as the commanding officer but not his last. He went on to be the commanding officer of two other ships, the USS Underwood and the USS Somerset. “Not many folks have the opportunity to command one ship so with me having the opportunity to command three ships, I consider that an awesome privilege that you would not get anywhere in the world except in the Unites States,” Dearborn said. The Navy didn’t just give him the opportunity to command ships. It also gave him the opportunity to further his education. Dearborn later attended the Naval War College, earning a master’s degree in national security and strategic studies. After his retirement from the military, Dearborn drove across the country with his wife, from San Diego to Mount Vernon. He then went down to Florida, stopping in Norfolk, Va. to visit his daughter who is also in the Navy, serving aboard the USS Mason as the assistant supply officer. “I’ll take a couple months off and then put myself back in a position where I can serve,” Dearborn said. He wants to work as a mentor to help people at the local junior ROTC or work with the local or state government in a capacity where he can share his experiences and lessons. “I feel very very blessed. The opportunities that were given to me were shaped by the thousands of people I have come into contact with, from when I first arrived in 1975 to those I have served with and led. It was really them who have made me successful. I couldn’t have done it alone,” Dearborn said. After a long career in the military he expressed thanks for all that has been given to him since arriving in the country. “As a 10-year-old half Korean boy, I never thought I would have retired as a Navy Captain after 30 years,” Dearborn said.